The scammers behind NYC Bagel & Sandwich Shop are reaping millions of dollars by exploiting the dreams of positive, hard-working people who are trying to build better lives for their families. In this post and video, we continue exposing the ads and the sales pitch that is spreading misery, bankruptcies, home foreclosures and is devastating families across America. Please share this link and this video and support our GoFundMe initiative so no more families and individuals get scammed. (UnhappyFranchisee.Com) In the previous posts and videos, we showed how to identify NYC Bagel scam ads on Craigslist by their headlines, appearance and initial pitch and a NYC Bagel and Sandwich Shop franchise opportunity scam? The expert con-men behind this scam (Dennis Mason and Joe Smith) are not targeting individuals who dream of easy money or getting rich quick. This is not a sales pitch like those emails that promise millions by helping to recover hidden funds of some deposed Nigerian prince. This pitch is geared for individuals who are willing to work hard to achieve the American Dream of owning a family business. “NYC Bagel & Sandwich Shop” is offering a “limited time only,” discounted and “exceptional” special in your specific market. Franchisees will have right to offer other menu items of their choice in their NYC Bagel & Sandwich Shop stores. 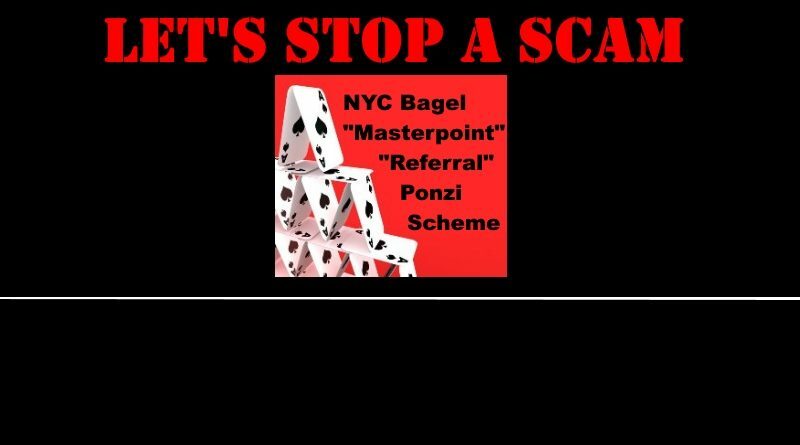 The “Master Point” or “Store Referral” program is the ponzi-scheme element. You can’t trust ANY positive feedback any NY Bagel or NYC Bagel and Sandwich Shop franchisee gives you because they might actually be relying on getting a cut of your franchise fee and will tell you its a great opportunity even if they’re on the verge of closing. DREAM DINNERS: Should Meal Assemby be a Diet Concept?